We were inspired to create a personalized book celebrating adoption by some very special Frecklebox customers, who also happen to be adoptive parents. Our customers originally contacted us to ask if we could adapt our “Big Sister Book” to work for their family. Our book features a pregnant mom talking with her daughter about bringing a new baby home. This family needed a book without that imagery — one that conveyed the same type of loving message, but that referred to adoption. So, instead of adapting our current book, we decided to create a new one! 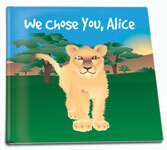 Children are “chosen” all the time to complete a family, and this book’s story and illustrations reflect that through lighthearted yet sincere portraits of different animals welcoming new additions to their own families. We hope you enjoy reading “I Chose You” as much as we enjoyed creating it.